The goal of behavioural economics is to improve the explanatory and predictive power of economics. This can be achieved by using theoretical and methodological resources of psychology. Its fundamental idea is that the relationship between psychology and economics cannot be subsumed under standard philosophical accounts of intertheoretical relations. 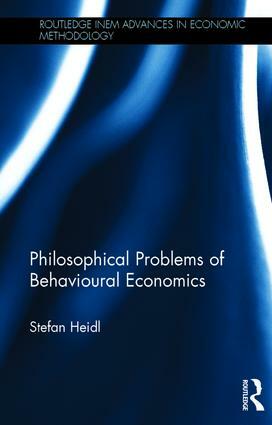 Philosophical Problems of Behavioural Economics argues that behavioural economics is best understood as an attempt to deidealize economic theory guided by psychological research. Behavioural economics deconstructs the model of decision-making by adding different elements. Based on this understanding behavioural economics has a number of tasks: first, it has to identify which economic theory needs to be challenged; second it aims to identify factors which need to be modelled within economic theories of choice and modify the theory accordingly; and finally, it has to create models that explain economic phenomena based on the new theory. This book analyses the different stages of this deconstruction process and shows how the scientific disciplines of economics and psychology are connected by it. This volume develops a new account of intertheoretical relations based on the idea of deidealization and thus contributes to debates within the philosophy of social science. It is suitable for those who are interested in or study economic theory and philosophy, economic psychology and philosophy of social science. Stefan Heidl is a lecturer and research associate at the Institute for Philosophy, University of Bonn, Germany.